Hyundai's new look can be seen in the details. 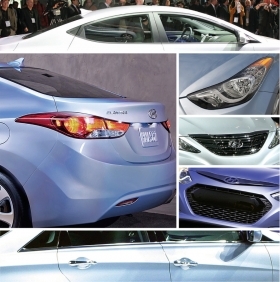 Clockwise from top: the raised beltline and narrow windows on the 2011 Elantra; the "eagle eye" headlights that wrap around the Elantra's fenders; the winged grille on the gasoline-powered Sonata; the Sonata Hybrid's hexagonal grille; the "orchid stroke" crease inspired by Korean calligraphy on the Sonata; the streamlined silhouette of the Elantra's high rear deck. HWASEONG, South Korea -- Steeped in Confucian conformity, Korean culture can be stultifying. Oh Suk-geun had worked in Hyundai Motor Co.'s styling studios for five years, but it wasn't until he was sent to design school in California that he learned how true that can be. The man who now leads Hyundai's global design division says one of his first assignments at the Art Center College of Design in Pasadena was to draw a small car meant to attract young people. An unimpressed instructor gazed at his sketches posted on a wall and asked: "What's new?" "I didn't realize at the time how humiliating the comment was," Oh says. "I didn't understand why we should do something new. Korean designers hesitate to show their own ideas, styles." From that moment on, Oh was determined to break the mold -- Asian mores be damned. His ambition has culminated in a new look for Hyundai that dares to be different, with swoopy designs, sharp creases, sculpted front ends and high beltlines. Hyundai is making flair a priority, and it shows. From the Tucson SUV to the redesigned Sonata sedan and Elantra compact, Hyundai's lineup is being praised as grand, instead of bland. "We didn't want something basic. We wanted something talkative," says Oh, 51, who became global design chief in 2007. "We needed to create a Hyundai-original design." The order to spiff up Hyundai's humdrum, econobox image came straight from Chairman Chung Mong-koo. Hyundai's design team calls the look "fluidic sculpture." The shift to a more eye-grabbing design comes as Hyundai aims to extend sales gains won through attention to quality and technology. Styling was the missing piece of the puzzle. The goal is to imbue a younger, more sensuous look through the use of flowing lines drawn from nature, along with sculpted details. Elements could be seen creeping into the Hyundai Genesis Coupe in 2008. But the 2011 Sonata that came out this year epitomizes the new style. "Hyundai is confident about our engineering capabilities," the soft-spoken, bespectacled Oh says. "So we thought with this model, we have to tell customers of other brands something about ourselves. Originality was the No. 1 consideration in developing this vehicle." Since the revamped Sonata was launched this year, its monthly sales in the United States have soared, more than doubling the volume of the more pedestrian previous version. -- An "orchid stroke" side crease inspired by Korean calligraphy. -- Streamlined silhouettes with high rear decks. -- Raised beltlines and narrow windows. -- Winged grilles for upscale models such as Sonata and Genesis. -- Hexagonal grilles for small cars and specialty vehicles such as SUVs. -- So-called "eagle eye" headlights that wrap around fenders. Executive Vice President Cho Won Hong, Hyundai's global marketing chief, wants improved aesthetics to nudge the brand upmarket into a niche he calls modern premium. "We want to emphasize look and feel," Cho says of a new "modern premium" marketing campaign to be launched next year. He expects it will also help Hyundai command higher prices. When Oh was growing up in South Korea in the 1960s, seeing cars on the road was still a rarity. His dream of becoming an auto stylist was fueled partly by the disappointment of learning that the first car developed independently by Hyundai, the Pony of the 1970s, had actually been designed not by Koreans but by the Italian studio Italdesign-Giugiaro S.p.A.
"I really wanted to do our own designs," he says. 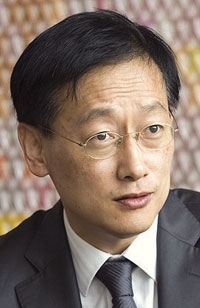 After joining Hyundai in 1984, the company sent him to hone his skills in the United States. His first task after graduating from the Art Center in 1990 was setting up Hyundai's design center in California. Oh's early work includes the first-generation Elantra that debuted in 1990 and the Hyundai Scoupe sporty coupe. He also penned the HCD-1, short for Hyundai California Design, a roadster concept that was unveiled at the 1992 Detroit auto show. Until two years ago, most of Hyundai's cars followed the pattern pioneered by Japanese brands such as Toyota: inoffensive designs that were high in utility but evoked little emotion. Engineers invariably won disputes with the stylists, stamping out what they saw as frivolous flights of fancy. But in the meantime, Hyundai was slowly edging out of Toyota's shadow. "Hyundai could not be the No. 1 manufacturer in the world by doing the same thing as Toyota. We had to find our own way," Oh said. "There is a kind of dramatic pattern shift at the moment." The global design studio now occupies its own building on the Hyundai-Kia Group's Namyang technical center in the rural town of Hwaseong, about an hour's drive south of Seoul. Oh says design's rising clout is illustrated by internal struggles over the Sonata's raised beltline. Engineers wanted it lowered to increase driver visibility, but Oh wanted to minimize the windows and give the car a sleeker, more coupe-like look. Oh's windows stayed. "Designers and engineers always have some kind of conflict. Engineers always want to make it more functional, and designers want to make it more dynamic and more aesthetically ideal," Oh said. "But with the Sonata, the engineers fully accepted our ideas." He compromised aerodynamics for vanity's sake. The hybrid version of the Sonata gets a crisp crease along the back of the rear fender to help reduce drag behind the vehicle. That helped improve the drag coefficient of that vehicle, for which fuel efficiency is a top priority, to a wind-cheating 0.25. But unsatisfied with the hard-edged look, Oh kept the original rounded design on the all-gasoline Sonata, despite handicapping it with a less aerodynamic drag coefficient of 0.28. "Systems sometimes deny the designer's opinion," Oh says. "But designers need to have their own identity and personality. Our system at the moment has that kind of understanding."